easyJet has announced it has entered into a long-term partnership with visitBerlin, the official promotional organisation of Germany’s capital city. The intention is to effectively promote tourism to Berlin, both from Germany and also the wider European market. The move comes on top of easyJet’s acquisition of part of the now defunct airBerlin which operated out of Berlin Tegel. The strategic partnership will see different areas of collaboration, including the creation and spreading of local content to inspire visitors from around the world to visit Berlin and experience its culture, atmosphere and lifestyles. The partnership will generate revenue for visitBerlin through the sale of the Berlin WelcomeCard on board and we will exchange information to continuously develop the network and services. In 2017 easyJet flew 3.5m international passengers into Berlin, which was more than any other airline, including Lufthansa, while the expansion into Tegel should increase year-on-year visitors to 5.6m. easyJet will operate 19 daily domestic flights from Tegel, on four routes, to and from Dusseldorf, Frankfurt, Munich and Stuttgart, and will introduce 15 new destinations from Tegel, to include Budapest, Madrid. Tel Aviv and Rome, among others. easyJet is now established as Berlin and Brandenburg’s home-based carrier, with almost 16 million passengers travelling to and from Tegel and Schönefeld airports. Travelers will be able to choose from more than 100 destinations from March onwards and 28 of these destinations are only operated by easyJet. Southeast Aerospace, a leading Aerospace Solutions company, has welcomed Luke Gomoll, as its new Aircraft Modifications Sales Representative. Luke brings 10 years of Aircraft Modification experience, with 8 years at JA Air Center, and almost 2 years at Elliott Aviation. He's enthusiastic about growing current relationships, acquiring new light to heavy Jet customers in an effort to assist with all their avionics needs, and adding new capabilities to the company. Safran and Vietjet Air have signed a Memorandum of Understanding (MoU) designed to bolster the strategic partnership between the two companies. The MoU encompasses several areas of collaboration related to Safran Aircraft Engines business in commercial engines, ranging from the development of VietJet Air's business, via the future acquisition of airplanes, to fleet management services, training, and help in setting up on-site support capabilities. Based in Ho-Chi-Minh City, VietJet Air has been a customer of Safran Aircraft Engines, via CFM International, since 2011. The airline started operation that year with Airbus A320 commercial jets powered by CFM56-5B engines. Today, VietJet Air operates 57 CFM56-powered A320 family aircraft, and has also signed by-the-hour service contracts for these engines. To support its business growth, in 2016 VietJet Air announced an order for 100 Boeing 737 MAX twinjets powered by LEAP-1B engines from CFM International. Deliveries of these aircraft will start in 2019.
easyJet has signed a five year agreement with Airbus to provide predictive maintenance services for its entire fleet approaching 300 aircraft. The technology relies on Airbus’ Skywise data platform which will allow easyJet’s engineers to intervene early and replace parts before the component’s failure, thereby preventing passengers from experiencing delays and cancellations. The new technology builds on extensive trials of the Skywise platform allowing easyJet to remove components before faults occur, thus enabling more flights to operate on schedule. Skywise can now analyse data from other components on easyJet’s aircraft thanks to the installation of Airbus’ newly released flight operations and maintenance exchanger FOMAX – which collects 60 times more data than existing systems. The new equipment will be fitted on easyJet’s fleet by summer 2019. 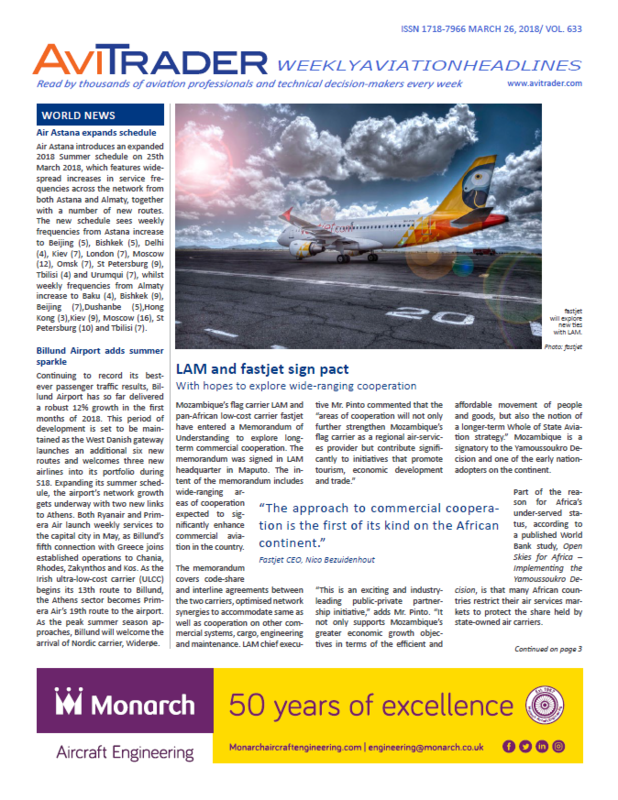 Honeywell International has expanded its channel partner network across Africa to better service airlines, business aviation operators, and defense and space contractors. Under agreements with channel partners, including ExecuJet Nigeria and Aerotechnic, Honeywell can provide operators with in-region access to Honeywell International avionics, connectivity services, and certified maintenance and upgrades. AeroLogic has signed a contract with CrossConsense to implement the CROSSMOS® eTLB. The joint venture of DHL Express and Lufthansa Cargo currently operates 10 Boeing 777F aircraft in a worldwide route network with destinations in Europe, Middle East, Asia, North and South America. By implementing CROSSMOS® AeroLogic is taking an important step moving towards paperless maintenance. Aeronautical Engineers, Inc. (AEI) has signed a contract to provide Vx Capital Partners with an additional B737-400SF freighter conversion. The aircraft (MSN 28867) will commence modification in May 2018 and will be redelivered to Vx in October 2018. AEI’s Authorized Conversion Center, Jacksonville, Florida-based Flightstar Aircraft Services will perform the modification touch labor and maintenance requirements. This conversion represents the twenty-second AEI B737-400SF freighter for Vx. Magnetic MRO has completed a major milestone and is fully authorized to provide line maintenance services for Airbus A330 family. The total technical care maintenance and asset management organisation has further expanded its line maintenance capabilities following its Part 145 Approval being upgraded on March 22, 2018. The approval covers all three engine types used on Airbus A330 family aircraft: Rolls-Royce, Pratt & Whitney and GE Aviation. The company will keep investing in the wide-body market in order to provide an even more comprehensive and flexible technical support to its customers at large international airports. 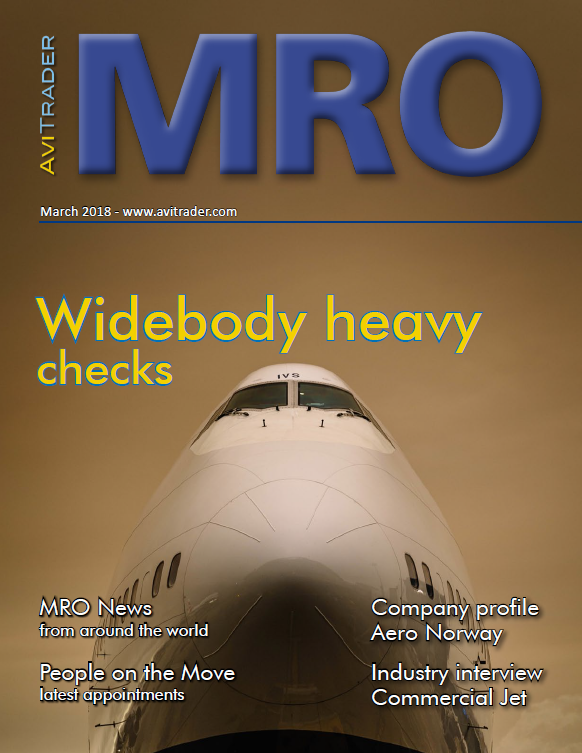 Along with the latest addition, Magnetic MRO line and base maintenance capabilities now cover A330 family, A320ceo/neo family, Boeing 737CL/NG, CRJ-700/-900NG, ERJ-170/-190, SAAB 340 and ATR 42/72. China Eastern Airlines (CEA) and GE Aviation reached agreement to provide a comprehensive digital analytics solution for the CEA fleet of more than 700 aircraft over the next three years. GE Aviation and CEA started their digital collaboration in 2013. As part of the agreement, GE Aviation will provide digital analytics based on GE's big data platform that will define in-depth digital cooperation between the two companies for the next three years. The agreement covers more than 50 digital service projects spanning from engine and aircraft maintenance, flight safety, operational efficiency and marketing/revenue analytics.